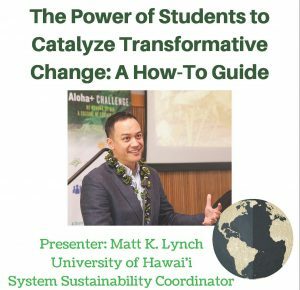 UH System Office of Sustainability coordinator Matt Lynch presented a lecture on the intersection of sustainability, students, and institutional change. The talk was sponsored by Global HOPE Hawaii and the UH Hilo Sustainability Committee. It was held on Thursday, April 20th. Whatʻs Happening in UH Hilo? March wasnʻt only a busy time when it came to studying and tests! members, and the active composting student body (including YOU)! April is Environmental Stewardship Month! There are so many things you can enjoy while making an impact on campus. Note: Geography and Environmental Society will be having outreach at Earth Day Fair with the objective of informing people about the carbon fee and dividend, have people fill out form (check it out), write letters to Congress, and build a social media audience at https://www.facebook.com/CCLHawaiiIsland/. Let’s have fun and be susty! What’s Happening at UH Hilo? 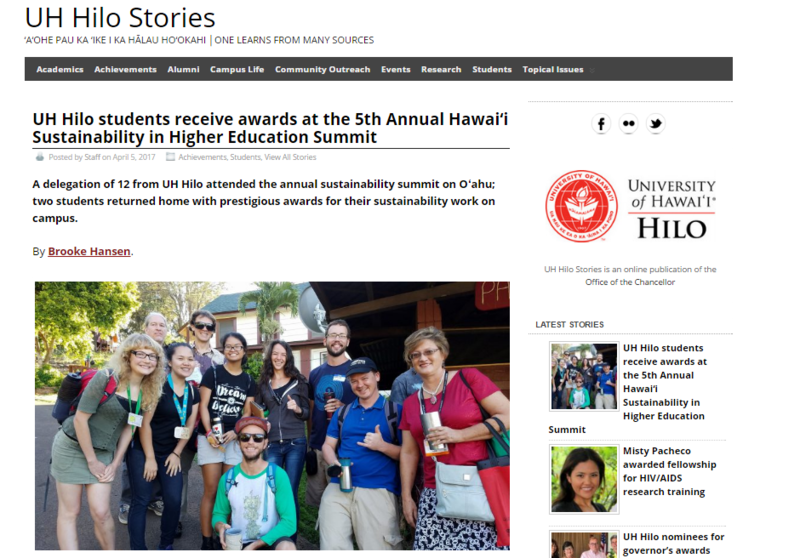 Since the early weeks of the semester, your UH Hilo Sustainability Team has been off to an incredibly effective start. 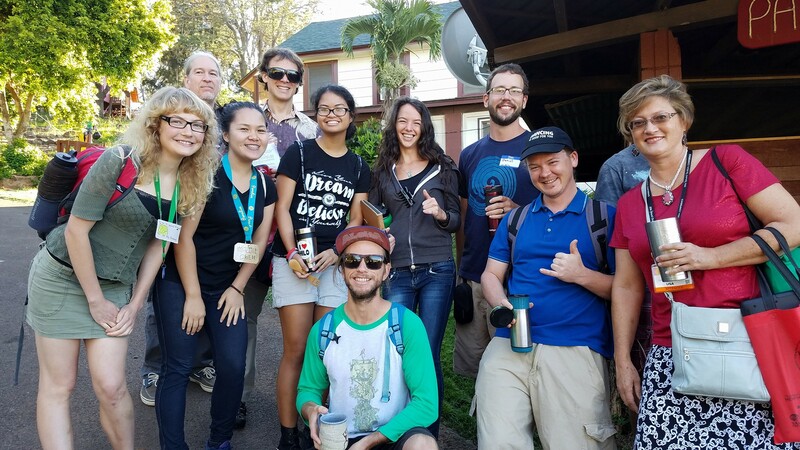 New to our campus, is an establish Sustainability Coalition of the University of Hawaii at Hilo (SCUHH). 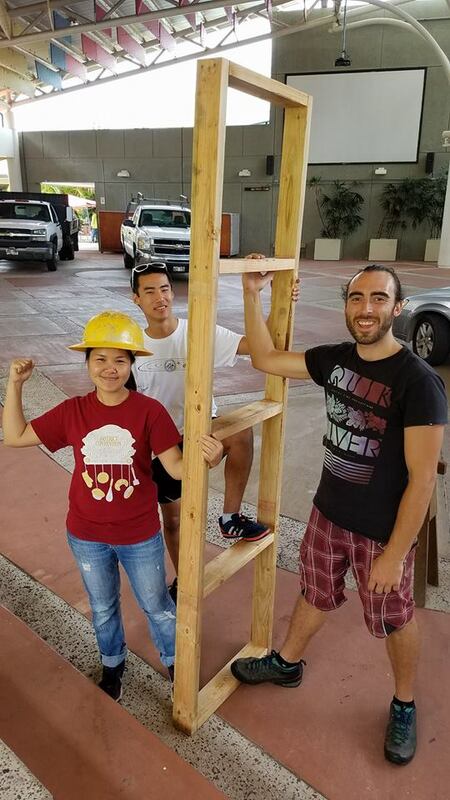 Comprised of this coalition is the UH administrative sustainability committee, UHHSA sustainability committee and the newest entity- the Students of Sustainability (S.O.S). Together, the 3 groups have been working efficiently to implement new sustainable systems and policy’s on campus. In association to this project, the sustainability committee has been working on a campus wide waste analysis study, mainly focusing on the waste generated via our 3rd party food vendors on campus and alternative solutions. Certain policy’s are working to be established such as a institutional wide ban on Sytrofoam. Any commentary on this behalf is encouraged and can be submitted to uhhsust@hawaii.edu. S.O.S is also working on construction of two large waste stations for the main campus SODEXO dining hall. These waste stations will replace the current waste options in place and encourage students to sort their waste accordingly. Anyone interested in volunteering for construction of these bins can contact S.O.S. The University of Hawaii’s 5th annual Sustainability Summit is approaching this month, March 16-18th at UH Manoa Campus. Your SOS Executive Committee will be attending in hopes to collaborate with other campus’s with new innovative plans to sustain our entire system, ultimately contributing to healthier and happier island wide communities! Kolin reports: Bluezones signage is now up on campus, in far off parking spots. Kalei has passed torch to Misty Pacheco at KES and Michelle Sylvester at the Library. Initial web page has been created <hilo.hawaii.edu/bluezones/> based off of Ka Lono article. Energy Storage project out to bid – job site is outside STB. Bids close in March. 1000$ energy rebate received in end of January; another one is pending for library, the total ($5K+) will be returned to the Energy Savings Reinvestment Account. Power lights → Bi-level LED upgrade is pending. Bidder is working on modifying the drivers to avoid needing filters to protect from light pollution…. On Energy Rebate: Hawaii Energy started working on rebate 10 years ago, before that it was HELCO. Historically, we had over 150K $ in reduced power charges. EKH walkway is the sample of the best solution – bi level LED lights. Idea: Develop an overview article about the different kinds of lighting solutions. Procurement of Bucket Truck is in the works – We bought the truck chassis, bucket manufacturer has it, and it is in the process of being returned. Expected arrival this summer. Kevin (Electrictician) has been prioritizing internal lighting replacement, so future time can be dedicated to outside replacement of pole lights. Spending $500,000 capital to do away with a 700,000 spending, and labor will be done in-house. End result, 200k savings, plus we will own the bucket truck. Dimmers: installation of dimmable LEDs proceeding in UCB upper floors. Doing maximum usage buildings first will maximize savings. AC costs are also reduced for LEDs. All buildings have energy monitors built in to them, as many of four in UCB, STB… Data is generated via EMON – meters are built into the buildings. Can these be connected to LeedOn.io dynamic wall plaque or similar display? Curriculum committee got through 29 courses in a semester. Certificate development is pending – which courses would be placed within the certificate . A hybrid certificate is being considered. Intake Application process for the 5th annual Sustainability Summit. Secured funds from UHHSA to ramp up food collection efforts. Building sort stations for food waste is ongoing. Alexis is installing industrial size sort stations, with recycle, landfill, compost – those will replace the existing trash bins. Plan → quote → UHHSA funding → puchase materials → Kolin will send out for HawCC carpentry students to assemble this summer. 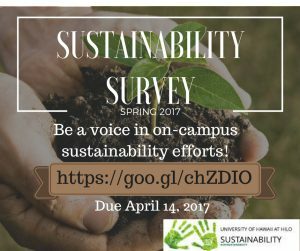 UHHSA allocated 1500$ for student led sustainability / campus greening projects…. At the stage now where they need to determine eligibility / award requirements. Waste-Station manpower is needed for future events. Collaboration between 3 sustainability groups – this committee, the Students of Sustainability group, and UHHSA. Schools are signing up, 21st of April, Friday. New Gym reserved. Keynote in the morning – Hula groups, Merrie Monarch tie-ins. Students want a post-earth day celebration concert – 3 or 4pm. Aloha mai kākou, Interested to bringing more Sustainable practices to our Hilo Campus? 5:00pm in the College of Agriculture (CANFRM) Building Room 201.